Messaging, sending files and proposals, setting up site visits and calling the customer. Venuemob Manager has it all! When you message a customer via Venuemob Manager, your message heads straight to their Venuemob account, AND their email inbox. You're able to attach PDF files and online quotes (to which customers can pay a deposit securely via Venuemob). 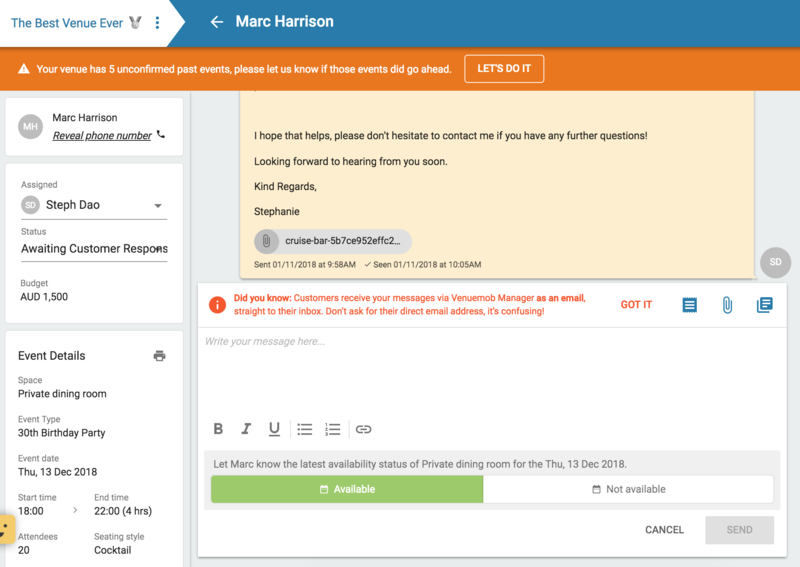 You can even respond directly through your email client to a notification email (with an attachment) and it'll get to the customer's inbox/Venuemob account. And of course, you have access to the customer's phone number in order to follow up. To the left, you can see the event details. Click 'reveal phone number' in order to do just that. To the bottom is where you can respond to the customer. Remember: it's important you respond to customer enquiries as quickly as possible. Customers will send enquiries to a number of venues per event they plan. To attach a file, click the paperclip icon. Yes, you can attach PDFs – including menus, quotes, and any other information. We don't recommend attaching images – after all, the customer has seen your Venuemob listing, which should be filled with imagery. Save time by using a template response (the icon to the right of the paperclip), or by creating a quote for the customer. Creating a quote will allow the customer to pay a deposit directly via Venuemob, with no credit card processing fees for you, the venue. ALL messages will appear in the enquiry feed, and ALL messages from you will be sent as a notification to the customer's email address. Click on 'Reveal phone number' in the top left hand corner of the enquiry view reveal the customer's phone number! When you receive a Venuemob enquiry, a notification email is sent to your inbox (check the 'Staff' section of Venuemob Manager to see which email address is connected to your Venuemob Manager account). Click Respond now to head straight to the Messenger feature (without having to log in) and respond to the customer. Reply directly to the email notification. The content of your email will go to the customer's Venuemob account, and they will receive an email notification containing your message. YES, you can attach files via your email client and they'll be sent to customers via Venuemob. Should I ask for the customer's direct email address? You'll notice a note explaining as to why you cannot see the customer's email address. To summarise: communication via Venuemob Manager allows us to not only track the progress of the enquiry in full, it also helps to provide accurate reporting. And also this way all communication is in the one spot, instead of scattered across different platforms.